The European Union and Iran have "turned a new page" in their diplomatic relations, the EU's foreign policy chief said on a visit to Tehran. Federica Mogherini said they had agreed to work on closer ties in a number of areas, including the economy, energy, education, migration and transport. The visit follows last year's historic nuclear deal with the Islamic Republic. 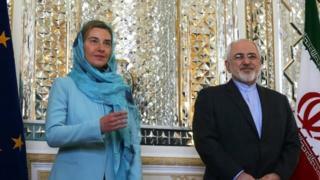 She said the results of their talks would "make a real difference" to the lives of Iranians and Europeans. Meanwhile, Iranian President Hassan Rouhani has been holding talks with Turkey's President Recep Tayyip Erdogan in the presidential palace in Ankara. They agreed to increase banking and economic co-operation and boost trade to $30bn (£21bn) within two years. Mr Erdogan said they also agreed to "reduce our differences" over Syria and other issues, to "work together to overcome the problems of terrorism and sectarianism and the related humanitarian crises that are shaking our region". Ms Mogherini said the issue of Syria and stability in the Middle East region had been discussed in her talks with Foreign Minister Mohammad Javad Zarif. Also, the question of human rights in Iran, of which she said "it is not a secret we have some concerns in this respect". Mr Zarif, for his part, welcomed the EU's support for Iran's bid to join the World Trade Organization, but called on the US to fulfil their commitments in relation to the nuclear deal and remove obstacles to the banking sector. Major European banks and businesses continue to be wary of investing in Iran, where US sanctions are still in place linked to alleged terrorism and human rights questions. "Iran and the EU will put pressure on the United States to facilitate the co-operation of non-American banks with Iran," Mr Zarif said. "It's essential that the other side, especially the United States, fulfil its commitments not on paper but in practice and removes the obstacles especially in banking sector." Engaging directly with Iran - a key player in Syria - is for Europe one of the main benefits of the nuclear deal. Iranian officials also said they wanted to strengthen this relationship - especially because the kind of dialogue is still too politically sensitive for Iran to have with the United States, reports the BBC's Chief International Correspondent Lyse Doucet, who is travelling with the EU delegation. Six world powers led by the US agreed in July last year to lift sanctions that had locked down much of Iran's economy for years in exchange for limits on Tehran's nuclear programme. How has Rouhani's Europe visit been perceived in Iran?